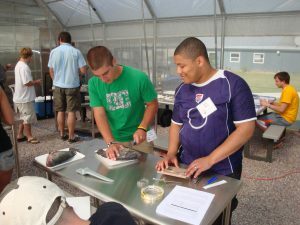 Aquaponics Classes, Semianrs and training from Nelson and Pade. Learn aquaponics from experts. 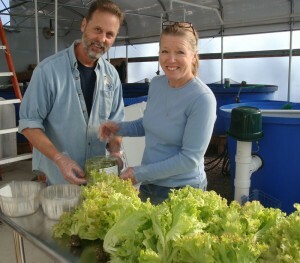 Nelson and Pade, Inc.® offers a variety of aquaponics classes, seminars and training. These classes are great for anyone looking to learn more about aquaponic food production. Whether you are brand new to aquaponics or are an experienced grower looking to expand your base of knowledge, we have a class for you. Rebecca Nelson and John Pade have been doing aquaponics and indoor farming since before there was an Internet! In the past 25 years, they have taught aquaponics to thousands of people from over 100 countries. They have a wealth of experience and knowledge to share. After every class, we hear from attendees who tell us the quality, content and level of enthusiasm at our Aquaponics Master Class® is top notch. Here is an example: “Well what can I say but thank you to the entire team. John and Rebecca…..thank you for creating a learning environment that was fun and relaxed. I have been to many conferences during my career as an educator, and this conference was one if not the best I have ever attended.” Stephen, Muskogee, Oklahoma. Read more workshop attendee testimonials. Our Most Popular Course Offering! This is a comprehensive course covering all aspects of aquaponics an d controlled environment agriculture. Our 3-day Aquaponics Master Class® is intended for anyone seriously considering getting into aquaponic food production, or those already doing aquaponics who want to learn more about the technology. We cover the topics most important to being successful in aquaponics including aquaponic methods and applications, crop choices and recommendations, water quality, daily operation and growing techniques, greenhouses and environmental control, fish biology and feeds, plant care and health, system start up, economics and business considerations. In the Aquaponics Master Class®, we don’t waste your time with fluff or with inexperienced instructors. We have developed a comprehensive and cohesive curriculum. We share the most important tips and techniques for growing and we show you the path to success in aquaponics, all based on our 20+ years’ experience in aquaponic food production. 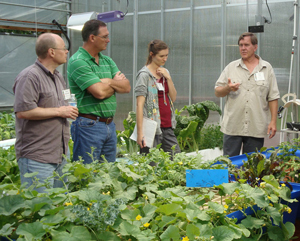 Learn more about the Aquaponics Master Class®. Our ESLP is is offered in individual sessions that can be booked at your convenience. 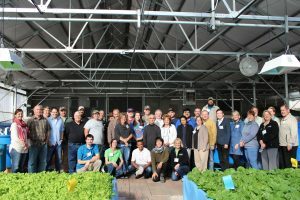 During the ESLP you will be experiencing, hands-on, everything that it is involved in running a Clear Flow Aquaponic Systems® in a controlled environment greenhouse. Plus, you’ll learn about system assembly and maintenance, marketing and other critical components of running an aquaponics business. Longer sessions available upon request. The ESLP is available to anyone who has purchased a Clear Flow Aquaponic System®. Transporting your system home at the end of your ESLP is an option. If you are a student and want to enroll in a 2 credit, full semester course on aquaponics, this is the course for you. Enrollment is through UW-Stevens Point, but you can be a student at any college or university. Course is offered in the spring semester. Registration for the Spring 2019 course now available! Class size is limited and enrollment is on a first come-first serve basis so sign up early to ensure your enrollment. Email us if you’d like to receive updated course schedules and information!